Featured by Apple in “Best New Apps”! Plan your next trip. Mark places you want to go. Remember your favorite spots. Across town or across the world, you’ll never forget another place with Pinbox! 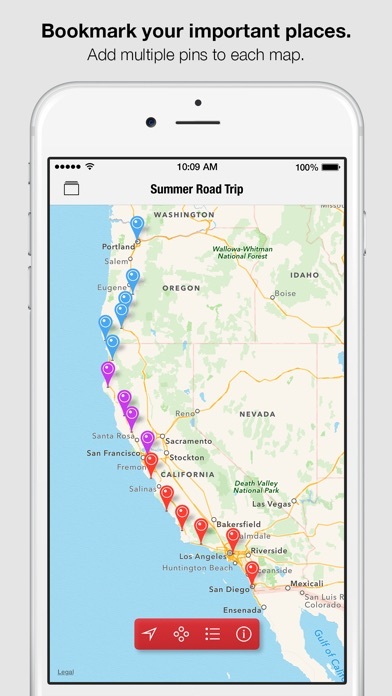 Add pins where you are, where you’ve been, or where you want to go. Pinbox makes it easy to quickly record and organize your important places into distinct maps for every activity, occasion, or geographic region. 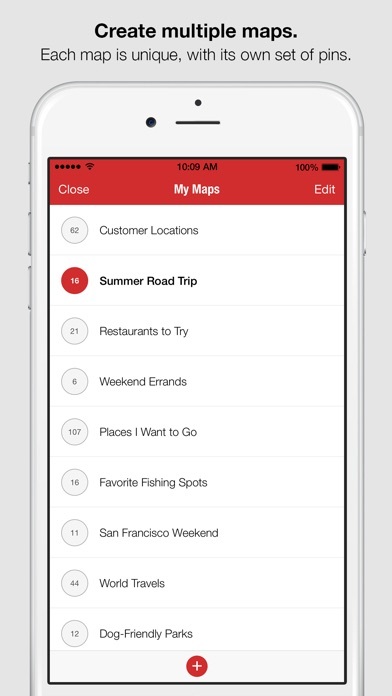 Unlike other apps, Pinbox doesn’t force you to save all your places on a single map. You can make one map for your favorite local restaurants - make another map for your next business trip or vacation - and make another map for errands you need to run this weekend. The possibilities are endless! Pinbox is about you and your places. It’s not a social network. You don’t have to create an account or enter your Facebook details to use the app. 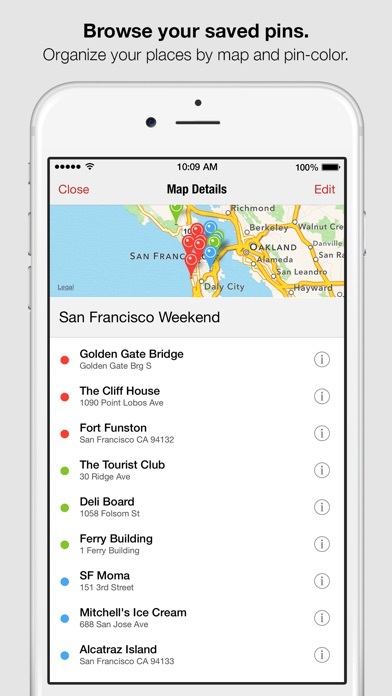 Your maps aren’t cluttered with random places bookmarked by strangers. 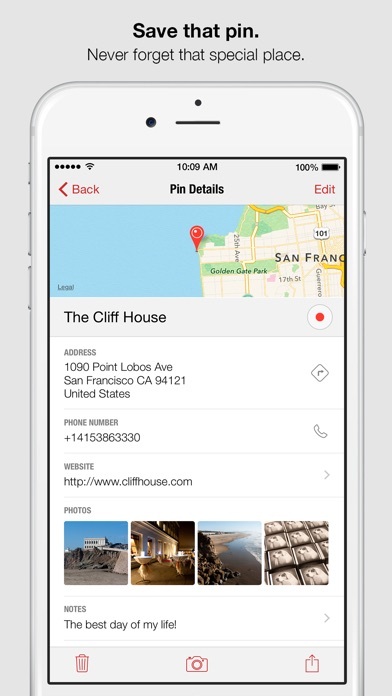 Pinbox is simply the best app for privately bookmarking places that are important to YOU! FEATURES • Simple, easy-to-use interface • Drop a pin for each place you want to remember • Add photos, notes, and other details to each pin • Choose from seven different pin colors • Organize your pins into separate maps • See your location in relation to your pins • Send maps to other Pinbox users • Send pins to Apple Maps, Google Maps, Waze, or Transit for directions • Save up to 2,500 pins • Display maps in Standard, Hybrid, or Satellite EXAMPLES OF MAPS YOU MIGHT CREATE • Travel planning • Favorite restaurants or restaurants to try • Customer locations / sales calls • Friends and family locations • Real Estate listings • Favorite hiking / biking trails • Secret fishing spots • Dog-friendly places • Parking spots • Favorite stores • Multi-stop errands • Potential photoshoot locations • The list goes on and on and on… Still not convinced? Here’s a few of our favorite reviews… “Pinbox is one of those simple apps that does one thing so well it feels frictionless”. -- Stephen Grassie “The interface is gorgeous - I would say that it looks like something Apple designed”. -- Macaddict “I have been using this to keep track of all the places the kids and I go so they can see how spread out our world is and they can see where all we have gone. Will use it forever”. -- 1Cool Daddy “This app is extremely useful and so simple to use. 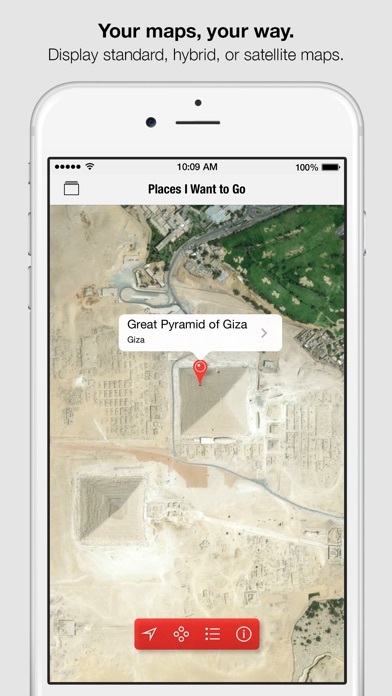 A lifesaver for keeping track of locations”. -- Davies Photo “I love this app. It is exactly what it claims to be. I have wanted this app since the smartphone was invented. So simple, and so many uses”. -- T1Man Using Pinbox on an iPod Touch or an iPad: Like other map apps, Pinbox uses GPS to determine your location. iPods and Wi-Fi-only iPads do not have a GPS receiver. On these devices, Pinbox provides your approximate location using information based on your proximity to known Wi-Fi networks (when on and available). The more accurate the available information, the smaller the circle identifying your position on the map. This feature is not available in all areas. Known Wi-Fi networks are predominantly in urban areas. An internet connection is required to load maps, look up addresses, and search. Although Pinbox can be installed on iPads, it’s not formatted for the larger iPad screen - it runs doubled like all other iPhone apps. Pinbox is the result of a collaboration between Scott D. Smith and Paul Burd. We sincerely hope you like it!